With hemp (Cannabis sativa) only just beginning to emerge on the forefront of herbal practice and scientific research, there is much curiosity and confusion in the herbal community surrounding the general use of hemp and what distinguishes it from marijuana or weed. In this article, I will guide you through a basic introduction to hemp, some qualifying factors, common clinical applications, and general forms of use so that you can walk away with a better understanding of how to incorporate hemp in your materia medica. Hemp may arguably be one of the most misunderstood herbs in the common era. 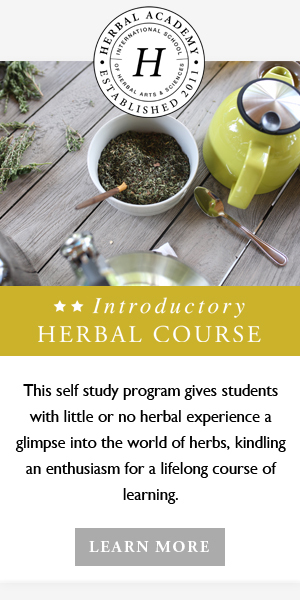 With so much misinformation out there, confusion whether it is a “drug” or an “herb,” and lack of understanding on extractions and dosage strategies, it’s no wonder that many herbalists simply avoid using it altogether. However, with its abundant beneficial properties and increased accessibility worldwide, it’s worth taking the time to get to know this plant and learning how to incorporate it into your materia medica. For starters: hemp and marijuana (Cannabis spp. ; also known as weed, pot, and cannabis, among other common names) are categorized as different herbs legally and in herbal practice due to the fact that hemp is bred without the primary psychoactive constituent, tetrahydrocannabinol (THC), which marijuana contains. In other words, hemp will not make you “high” like other forms of cannabis will, regardless of which form you use it in. Yes, it can be confusing that they share the same genus (Cannabis) which also happens to be a common name for both hemp and marijuana, but they are indeed classified as different herbs, which should be accounted for in your materia medica (Russo, 2002). To make things even more complicated, depending on what region and country you are in, the terminology used to refer to hemp can change completely. For instance, in some areas “hemp” is only used to refer to its use as a plant fiber and not as an herb (Russo, 2002). When in doubt, read the label on your hemp product carefully and inquire with the company or garden you are sourcing from for the confirmed levels of THC inside. In most areas, hemp companies are required to test each batch of product made and certify that their product is below a tiny percentage of THC in order to be qualified as hemp and sold as such. Chances are you may have heard about cannabidiol (CBD) and its health-supporting uses in the medical field. While CBD is indeed a powerful constituent in hemp, and the most researched, it is not the only one! CBD is simply “the most common phytocannabinoid” in hemp and the “second most prevalent in some drug chemotypes” (Russo, 2011). Although there are many successful studies confirming the benefits and versatility of CBD as an isolated constituent, hemp naturally grows with an abundance of other health-supportive constituents as well. There are hundreds of constituents in hemp which all play a synergistic role in the effectiveness of the herb as a whole. When you are choosing which extract to incorporate into your practice, consider using a whole hemp extract that includes all of the constituents in hemp together as one. Dr. Ethan Russo, one of the leading researchers of hemp and cannabis worldwide, suggests that current research of CBD is only the tip of the iceberg compared to the vast amount of beneficial research yet to be uncovered on the other constituents in hemp. Dr. Russo states: “Cannabis has been a medicinal plant of unparalleled versatility for millennia, but whose mechanisms of action were an unsolved mystery until the discovery of tetrahydrocannabinol (THC) . . . While a host of phytocannabinoids were discovered in the 1960s: cannabidiol (CBD), cannabigerol (CBG), cannabichromene (CBC), cannabidivarin (CBDV), and tetrahydrocannabivarin (THCV), the overwhelming preponderance of research focused on psychoactive THC.” (Russo, 2011). Many herbalists who incorporate hemp in their materia medica note how profoundly relaxing it can be. This is largely due to the numerous constituents in hemp that help regulate the nervous system. CBC, CBD, and CBG are all important constituents that are known to provide positive effects on conditions of the nervous system such as anxiety and depression (Russo, 2011). When choosing to utilize hemp for supporting conditions such as anxiety and depression, consider the connection to clinical endocannabinoid deficiency (CED). The theory of CED is formed around the idea that deficient endocannabinoid levels exhibit comparable brain disorder symptoms (like depression and anxiety) as neurotransmitter deficiencies do (Russo, 2016a). Why is this relevant? Because hemp directly modulates our endocannabinoid system (ECS), helping restore its levels to a natural balanced state (also known as our “endocannabinoid tone”). The ECS is essentially a biological system where endocannabinoids (which are endogenous lipid-based neurotransmitters) bind to various cannabinoid receptor sites found throughout our entire nervous system (Pacher et al., 2008). One notable part of the ECS is a cannabinoid receptor called CB1, which has been shown to have a crucial homeostatic influence in the central nervous system (Glassab et al., 1997). Since our ECS is responsible for regulating major “homeostatic functions in the brain, skin, digestive tract, liver, cardiovascular system, genitourinary function, and even bone,” when things become out of balance, it is essential to draw from ECS modulators like hemp in your materia medica (Russo, 2016b). In a nutshell, the ECS functions have been characterized as “relax, eat, sleep, forget and protect,” but this list continues to grow as research unveils new discoveries each year (Di Marzo, 1998; Russo, 2016b). To use hemp as a nervine, try incorporating a hemp oil compound tincture in your materia medica. This form is most effective when taken orally, although it can be used topically as well. One of the premier and most common ways to incorporate hemp in your materia medica is to support pain relief. CBD, CBG, and CBC are three noteworthy constituents that research indicates have analgesic, or pain-relieving, qualities (Russo, 2011). This includes supporting alleviation of neuropathic, inflammatory, physiologic, and other forms of chronic pain. The type of pain you are addressing will determine which form of hemp you should use. A good rule of thumb for supporting pain relief or reduction of inflammation is to get the herb as close to the affected tissues as possible (P. Bergner, personal communication, 2016). For instance, if your pain is due to a recovering knee injury, apply a salve infused with hemp extract directly on the knee (avoiding any areas where the skin is broken since putting a salve on an open wound could potentially trap any infectious bacteria present and create a deeper infection or prevent the healing process). If your pain manifests as abdominal cramping, use an oral hemp oil compound tincture. Or, if your pain occurs as menstrual cramping, consider using a hemp extract-infused suppository. For musculoskeletal and injury-related woes, topical salves are more indicated than the oil compounds since the beeswax base allows for the herbal extract to sit on the skin for longer. This promotes deeper penetration into the layers of muscle and tissue, instead of using simply the oil itself which is absorbed faster and will not affect the deeper areas you want to reach. Learn more about making your own herbal salves here (you can amend this recipe to add in the hemp extract you are using). Cannabinol (CBN) is a constituent in hemp that has been found to support a healthy sleep cycle and relieve insomnia due to its sedative effects (Steep Hill Labs, 2017). Both CBG and CBD are GABA-uptake inhibitors which can promote slow wave sleep and increased sleep quality through creating a surplus of GABA in the brain (Mathias et al., 2001; Russo, 2011). This can also help ease the sensation of racing thoughts or an overactive mind at bedtime. Using a hemp oil compound internally is your best bet for incorporating hemp as a sleep aid in your materia medica. Depending on the dosage of hemp, the concentration of certain constituents, and the interaction between them, hemp can have mixed stimulating and relaxing effects (Russo, 2017). When initially figuring out your dosage strategy, start with smaller doses taken away from bedtime or sporadically throughout the day. Remember that, like other herbs, hemp works best when all the naturally occurring constituents are able to work together as one (aka “synergize”). Rather than stressing over which exact constituents are available in your formula or not, consider opting for a whole hemp extract which ensures you are getting a bit of everything (except the THC, of course). Since hemp is an extremely resinous plant, water and low-proof alcohol-based extractions are not the most effective methods to use. High-proof alcohol and oil-based extractions tend to work better for hemp and most other highly resinous herbs for that matter. Other common forms of extraction include infused honey and other edibles, salves, lip balms, and suppositories. The flower can also be smoked or vaporized. A more concentrated and efficient way to use hemp is to source a professionally made hemp extract (also called hemp oil) and incorporate that into your herbal preparation. Since hemp extract is oil soluble, using a fat or oil-based substrate is key. A common way to do this is to make a hemp-oil compound where the hemp extract is infused into a carrier oil (such as hemp seed or grapeseed oil) that is intended to be taken orally. Extracting hemp oil itself is quite the technical process and requires a degree of chemistry and engineering to make, in addition to needing more expensive equipment. This is a key point for learning how to incorporate hemp in your materia medica. Since laws are differentiated state-by-state (and country-by-country), it is crucial that you read up on the laws regarding use of hemp in your area. With laws constantly changing, it is a good practice to stay on top of what is current if you plan on using hemp in your materia medica. Looking to incorporate hemp in your diet as well? Try our delicious Cherry Adaptogen Bites or Strawberry, Avocado & Hemp Seed Kale Salad recipes. Di Marzo, V. (1998). ‘Endocannabinoids’ and other fatty acid derivatives with cannabimimetic properties: Biochemistry and possible physiopathological relevance. Biochimica et Biophysica Acta, 1392(2-3), 153-75. doi: 10.1016/S0005-2760(98)00042-3. Glassab, M., Faulla, R.L.M., & Dragunowb, M. (1997). Cannabinoid receptors in the human brain: A detailed anatomical and quantitative autoradiographic study in the fetal, neonatal and adult human brain. Neuroscience, 77(2), 299-318. doi: 10.1016/S0306-4522(96)00428-9. Mathias, M., Wetter, TC., Steiger, A., & Lancel, M. (2001). The GABA uptake inhibitor tiagabine promotes slow wave sleep in normal elderly subjects. Neurobiology Aging, 22(2), 247-53. Pacher, P., Bátkai, S., & Kunos, G. (2008). The endocannabinoid system as an emerging target of pharmacotherapy. Pharmacological Reviews, 58(3), 389-462. doi: 10.1124/pr.58.3.2. Russo, E. (2017). Cannabidiol claims and misconceptions. Trends in Pharmacological Sciences, 38(3), 198-201. doi: 10.1016/j.tips.2016.12.004. Russo, E. (2016a). Clinical endocannabinoid deficiency reconsidered: Current research supports the theory in migraine, fibromyalgia, irritable bowel, and other treatment-resistant syndromes. Cannabis and cannabinoid research, 1(1), 154-165. doi: 10.1089/can.2016.0009. Russo, E. (2016b). Beyond cannabis: Plants and the endocannabinoid system. Trends in Pharmacological Sciences, 37(7), 594-605. doi: 10.1016/j.tips.2016.04.005. Russo, E. (2011). Taming THC: Potential cannabis synergy and phytocannabinoid-terpenoid entourage effects. British Journal of Pharmacology, 163(7), 1344–1364. Russo, E. (2002). Cannabis and cannabinoids: Pharmacology, toxicology, and therapeutic potential. Binghamton, NY: The Haworth Press. Steep Hill Labs. (2017). Cannabinol (CBN): A sleeping synergy. Retrieved from https://www.steephill.com/blogs/34/Cannabinol-(CBD):-A-Sleeping-Synergy. Heather is a Certified Clinical Herbalist and Nutritionist, Medical Anthropologist, Writer, Whole-Body Wellness Coach, and Holistic Educator. Connect with her on her personal website and Instagram.